Abstract: We estimate the impact of educational infrastructure consolidation (撤点并校, che dian bing xiao) on educational attainment using the case of China’s rural primary school closure policies in the early 2000s. The rationale for consolidation policies is that economies of scale will enable higher quality education, but distance to school increases for children in villages with school closures. We use data from a large household survey covering 728 villages in 7 provinces in China, and exploit variation in villages’ year of school closure and children’s ages at closure to identify the causal impact of school closure. 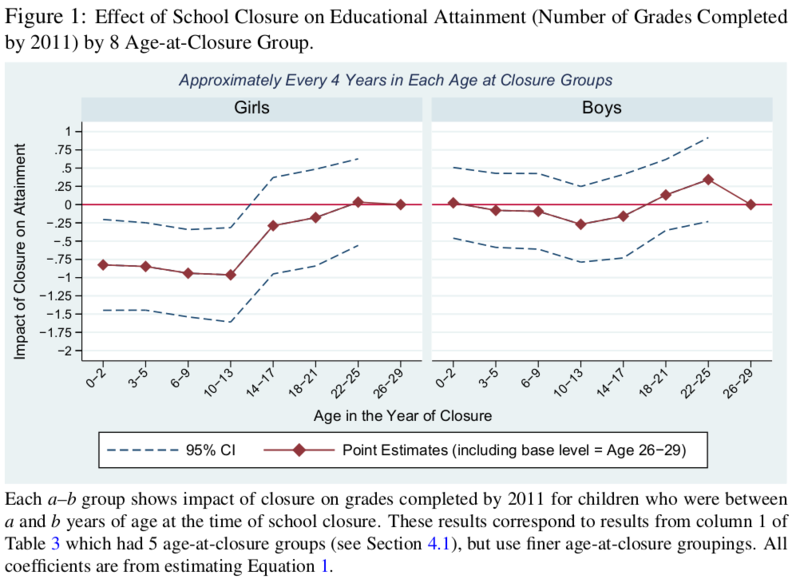 For children exposed to closure during their primary school ages, we find an average decrease of 0.60 years of schooling for girls after age 15, but no significant effect for boys. Negative effects strengthen with time since closure. 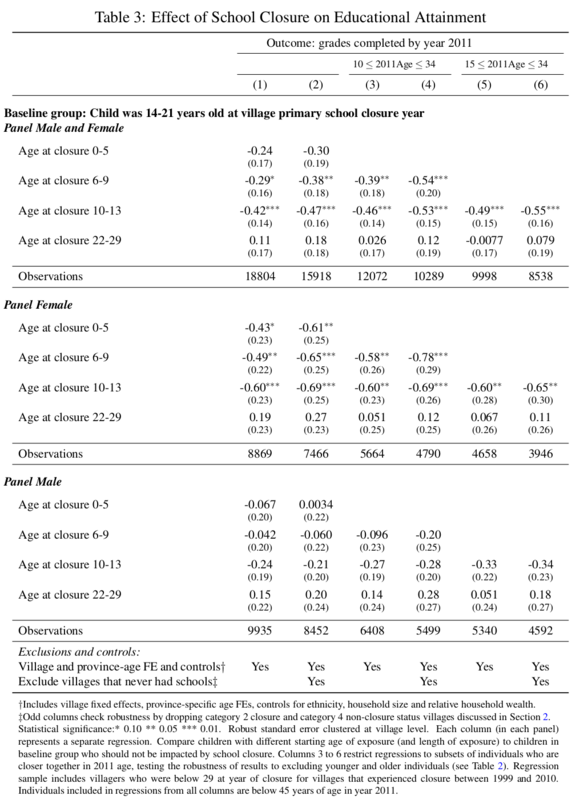 There is no evidence of a differential trend in educational attainment between individuals in villages with school closure and those in villages without, as indicated by an analysis using older cohorts beyond primary school age when closure occurred. Different effects by gender may be related to greater sensitivity of girls’ enrollment to distance and greater responsiveness of boys’ enrollment to quality. Educational infrastructure consolidation has been a long-standing policy response to declining student populations in high-income countries, with the rationale that economies of scale will enable higher quality education to be delivered in an efficient manner. However, the pressure to consolidate is expanding beyond high-income country settings, as more middle-income countries experience demographic trends of declining fertility, population aging, and rural outmigration. In low- and middle-income countries, past research has addressed the impact of school expansion (Duflo 2001; Breen 2010; Andrabi, Das, and Khwaja 2013; Burde and Linden 2013; Kazianga et al. 2013) and programs to improve access to school (Muralidharan and Prakash 2017) on school enrollment and attainment. However, to date, relatively few studies have considered the impact of school system contraction on student outcomes, outside of high-income countries. To our knowledge, this paper is one of the first to estimate the impact of school consolidation on educational attainment in a developing country. In the context of rural villages in developing countries, school consolidation could significantly increase the cost of school enrollment by increasing the travel cost of attendance, but might also increase the perceived return to education due to improvements in school quality. China is at the vanguard of the consolidation trend. Nationally, China faced dramatic declines in school-aged cohorts in the early 2000s due to fertility reduction. While fertility is generally somewhat higher in rural areas than urban areas, depopulation through unprecedented rural-urban migration has occurred in these settings. The State Council in 2001 initiated a massive national push to consolidate educational infrastructure. The school consolidation initiative, implemented by county level officials, intended to address sparse demand, inefficiencies in provision, and perceived quality problems in rural education (Mei et al. 2015). Consolidation has happened extremely rapidly in China. By some estimates, the total number of primary schools decreased by 53 percent between 2001 and 2012 (Ding and Zheng 2015; Ma 2017). We analyze the impact of these changes on educational attainment using the 2011 China Household Ethnic Survey (CHES 2011), which is a household and village survey implemented in 728 villages in 7 provinces in western China with substantial minority populations. Driven by the national directive to consolidate schools, 215 of the villages in the sample experienced village primary school closure between 1999 and 2010. Typically, closure decisions were made by county administrators who eliminated village schools and required students to attend schools that were farther away–generally located in township centers–but better appointed. In the CHES survey, compared to villages that had not experienced a school closure, villages that had experienced school closures are on average 3.8 km further away from the closest primary school. Compared to schools in villages without a closure, schools serving villages that had experienced closure have better buildings and technological equipment. 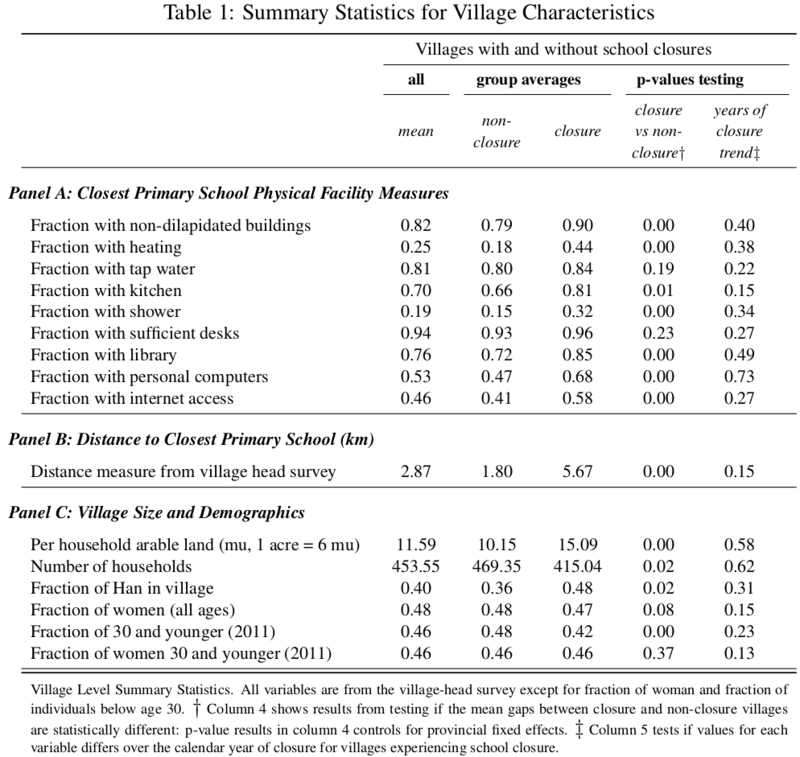 We find that villages with and without school closure in our survey have similar income levels, a similar fraction of agricultural and migrant workers, and similar gender compositions. Villages with closure have, on average, 13 percent fewer households (415 vs 469 households per village), indicating that county administrators tended to close primary schools in smaller villages.